Content can be developed without the understanding of how it will be positioned within a website or how consumers actually search for information. Websites can be designed and developed without a coherent initial content, SEO or search strategy – SEO experts are brought in after the site is completed to optimize the best that they can. SEO / content experts can know about search, but often don’t really understand in any depth how search relevancy works and how it impacts their content in search results. SEO, Content and Search need to be thought about in a unified way to generate the most benefits for your consumers. The graphic below is a very useful way to view how it falls together at a very high level. In this session I will deal with Human Search Behavior. How does Bob go about finding information? Bob is not a content expert, nor does he view the world organizationally like the company corporate librarian does. What are the right search terms? Is it “dealing with jerks”? In practice Bob will probably start his search looking for information through Google. He will search iteratively until he strikes gold, or gives up. There is remarkable keyword consistence in how people are conducting their searches in the AdWords data set (200 search phrases that are searched ten million times a month). In this analysis we have identified six search behavior patterns. 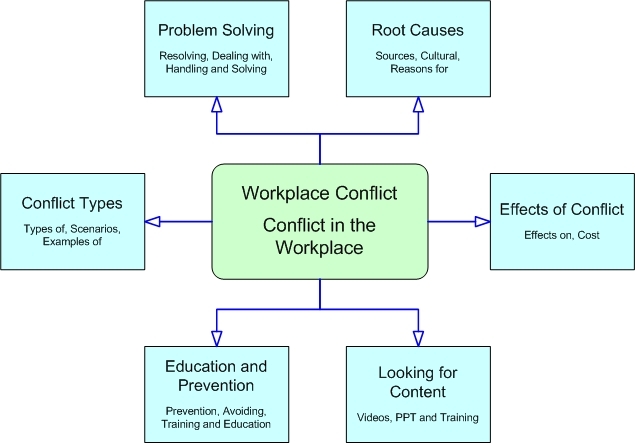 This knowledge suggests the following content creation strategy for Workplace Conflict. This analysis would also suggest that the Conflict in the Workplace website content be repurposed as a Power Point presentations, videos and PDF documents. Keep in mind that this analysis deals with just the top 25 searches by volume. If the analysis was expanded to the top 100 or 200 phrases more content opportunities would likely be available. The Conflict in the Workplace title should also be in the web pages’ URL link (i.e. WWW.MyCompany.com/Human-Resources/Conflict-in-the-Workplace). The phrase “Workplace Conflict” should be used in the Title and Description Tags, and as a major labeling device throughout the web page (H1 tags and Anchors). 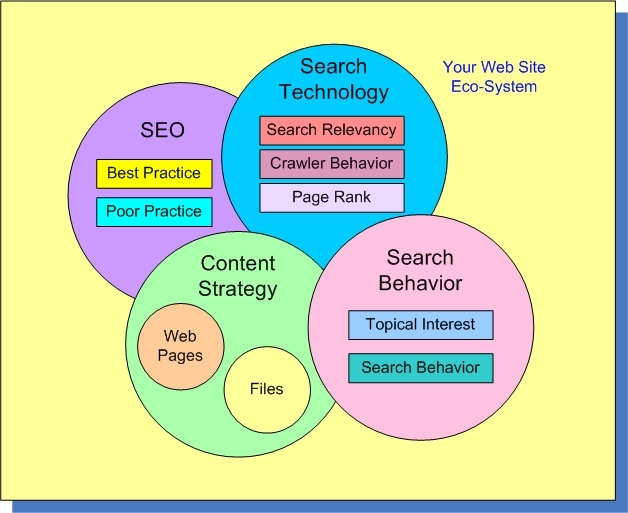 These primary and secondary terms which reflect real human behavior should be reflected in the body of the text, and in your web site SEO keyword strategy for web page optimization. Identifying how a topic is actually being discussed (the terms and phrases) requires research and thoughtful analysis. Doing this provides the basis for developing focused content that people actually search for and consume. For example, it is very useful to take a look at the secondary terms that are being used to see what else they can tell us about search behavior. When you resolve an AdWords data set for secondary terms it provides a different view of human search behavior. Understanding this provides the basis for developing a focused topical content strategy. But, how do you know which category is the most important? One approach is to look at the secondary terms that are being used to see what else they can tell us about search behavior. When you resolve an AdWords data set for the secondary terms it provides a different view of human search behavior, and it shows which of the terms are the most important. In the example below we see that the entire search experience can be summed up in ten to twenty secondary terms. The way to think about this table is that the terms Resolution and Resolve appeared in 894,079 search phrases in a single month (in 200 keyword phrases). Clearly when it comes to Workplace Conflict, user search behaviour overwhelmingly implies interest in “managing” and “resolving” workplace conflict. So what is the implication? This analysis suggest that Workplace Conflict Resolution is a major theme and should be used in the URL string and in the Title and Description Tags. The secondary theme would be Management of Conflict in the Workplace and would make an excellent H1 tag. Another option, you could combine Mediation and Techniques to create, for example, Workplace Conflict Mediation Techniques. The important thing to remember here is that the secondary terms in keyword phrases can help you fashion content people are actually searching for. Google taught the world how to search, and people are using the same methods on the Internet and in the Enterprise. If you have good search-logs that can be analyzed, you could use these to generate a search behavior model – if not, web search behavior is a good place to start. Thank you for your article. One tool that I use when doing keyword research is Google’s Wonder Wheel. This give suggestions for related search terms. Are there any other tool that you would suggest using? the precious ideas you presented do help my investigation for my group, appreaciate that. Thanks for replying, Mark. Your insights are very interesting — you should write a book. I appreciate for sharing your knowledge with newbies like me. Hi Devin, The insight comes from three sources; first – years of experience with consumers, usability and search engine technologies. Second, working with content, taxonomies and content classification projects – and finally, digging into technology behind search, meta data, and auto-classification technologies. I’m glad you liked the article. I like that this tackles some of the more technical issues that many blog posts and white papers don’t. Thank you. I added this post to my resources section in “QR Codes: What You Need to Know,” a primer for marketers and printers. It’s nice that you mentioned micro-codes, which is something I don’t see discussed in other places. Thanks. I was thinking of adding a round-up of all the other codes…do you think that would be useful? Thanks – glad you found the analysis useful…if you ever want to dig into more detail let me know.